The APS AmeriStamp Expo was held in Reno March 3-5 at the Atlantis Hotel. 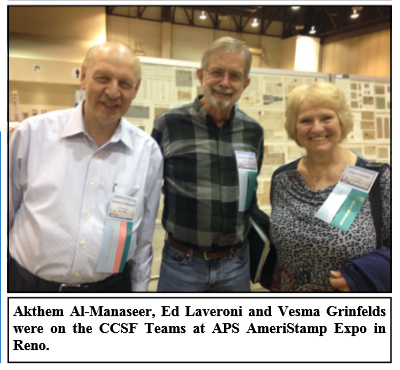 AmeriStamp Expo is a special APS exhibition showcasing One-Frame exhibits. In addition to a general competition, the show features a Champion of Champions (CofC) class that pits all of the OFE Grand Award winners from each of the national-level shows. Another special event at the show is a Team Competition among teams of five formed by exhibitors. The teams score points for medal level achieved, new exhibits/exhibitors and special awards. The team with the best total score wins. It is a friendly, but very serious, competition! 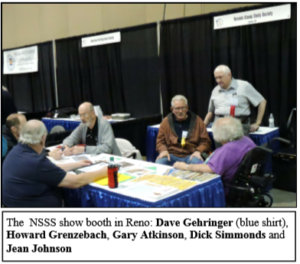 The Collectors Club of San Francisco fielded three teams of exhibitors, and all three teams did exceptionally well. 5 One-frame Youth Exhibits Plus a number of non-competitive exhibits. White Team won in a three-way tiebreaker in a field of six teams.